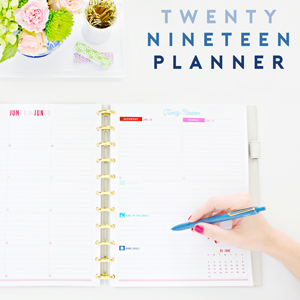 There is so much happiness in this week's feature; I am pretty sure we all just won the lottery in organizational eye candy! 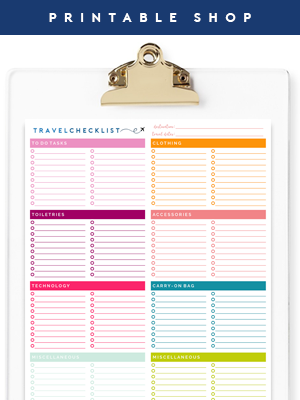 Organization does not have to be boring or sterile. In fact, it should be playful, fun and pretty. Those traits not only get us excited to work on an organizational project, but they drive us to want to maintain that space once it is completed. Karen, the incredibly kind girl behind the blog A House Full of Sunshine, created a beautifully organized space to work. Not only did she make a small area of her home a WOW statement, she really maximized the functionality. Although her office was crafted out of a small nook, it works just as hard as any full sized room would. I asked to her stop by today to give us the scoop and share how she was able to achieve organizational bliss. What is the main function of your space? "When we designed our new home, I knew I wanted to incorporate a family command center/study nook right off the kitchen. Basically, I was sick of everything being dumped on the kitchen counter when everyone walked in the door – mail, keys, wallets, iPads, sunglasses. I’d tried having a 'drop zone' in our previous house, but it was too far away from the kitchen and therefore was completely ignored by everyone. The kitchen is the hub of our home, and I’ve come to accept that we all want our stuff right there where we can access and use it. Instead of fighting against our natural tendencies, I decided to work with them. Also, I was keen to create an open-plan style office area where I could check email and catch up on blogging tasks here and there throughout the day, without secluding myself from the family. I have little kids at home, so if there’s a way I can stay right in the middle of the action and still get a few small things done when the kids are playing happily, it’s a win for all of us." "The game-changer for me was taking the time to identify our clutter 'problem areas'. For us, it was mail, technology (iPads, phones) and personal items like keys and wallets. I then created a different zone to help us deal with each of these. 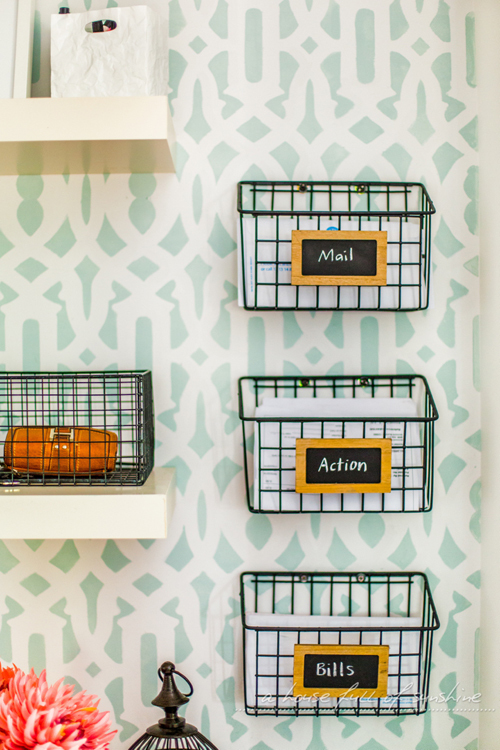 A wire basket on the shelf became a convenient drop zone for keys and personal items. I turned a Martha Stewart desk organiser into a charging station – it’s the perfect size to fit some iPads, an iPad mini and a couple of phones. I just cut a couple of slots in the end of the organiser for the chargers to fit through, and the cords then go down through a hole that our cabinetmaker cut out of the desk. It’s all invisible and very tidy. Lastly, I created a mail-basket system to sort our mail into incoming mail, action needed and bills. The wall-mounted system has been a great way to get mail off our surfaces altogether. I think it’s important to think through how you really use a space and troubleshoot any problem areas, because everyone is so unique in how they do life. 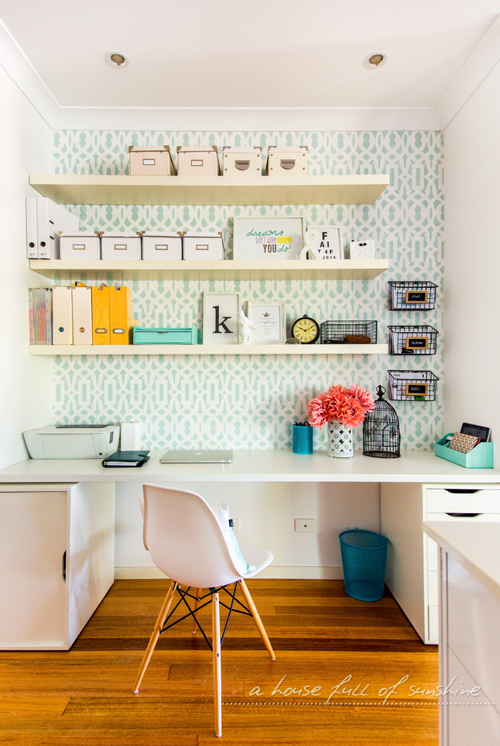 You need to organize an area so it works for you." What items did you find were essential when organizing the space, and why? "The Ikea floating shelves provide heaps of storage without making the space feel top-heavy. 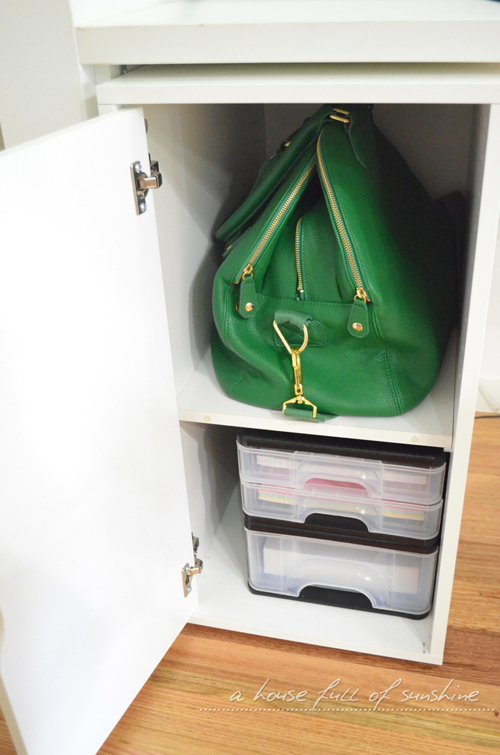 I used Ikea boxes to store items such as washi tape and scrapbooking supplies that are used only semi-regularly. An Alex drawer unit from Ikea fits perfectly under the desk to sort stationery supplies, camera equipment, leads and chargers. Having frequently-used items at my fingertips but hidden away keeps the space looking neat and tidy. On the left side, I have an Alex cupboard. On the lower shelf is a set of drawers with computer paper, colored card and white card, ready for printing. The top shelf holds my diaper bag. I used to just dump the bag near the kitchen island whenever I got home, because I had my hands full with kids and water bottles and just needed somewhere convenient to drop it. But of course, that’s where it often stayed. A simple shelf adjustment inside the cupboard gave me enough room to comfortably fit the bag - now I have somewhere to stash it where it’s out of sight but accessible. That’s been super handy, because that bag goes everywhere with me, and I love having it right next to the kitchen when I want to pack some snacks. 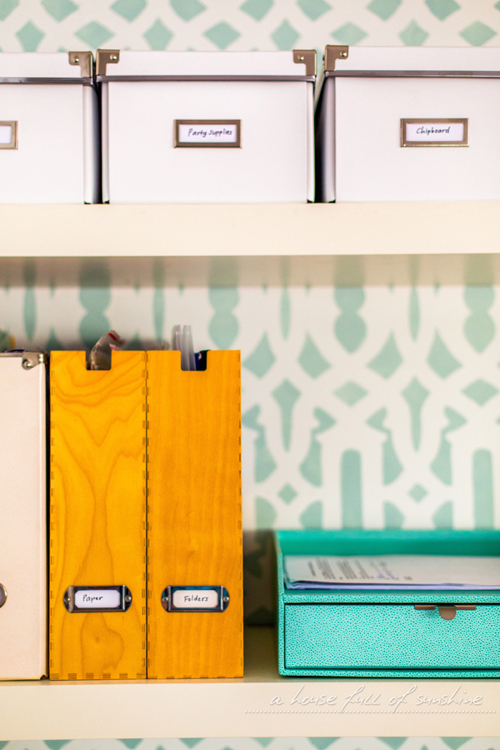 The inbox with drawer from Martha Stewart Home Office is where I keep my current in-progress paperwork, instead of leaving it strewn over my desk." "I always knew I wanted this space to look beautiful, because it’s open to the whole house. I also wanted to inject a bit of femininity. It’s the first time I’ve ever had a study area just to myself, so it was fun to create a space that showcases my personality! 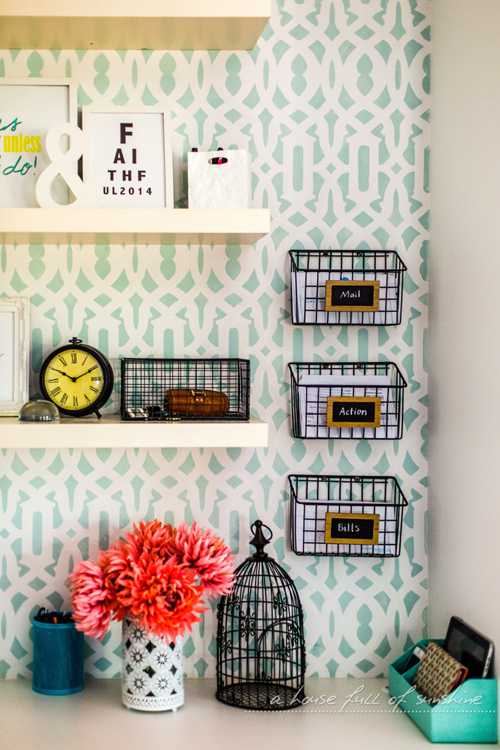 I began by stenciling the wall (I used the Trellis Allover pattern from Cutting Edge stencils.) It was cheaper than wallpaper, and I was able to choose the exact shade of paint I wanted to fit with my color scheme. I added a vase of pretty pink blooms from Target, and chose some sweet accessories to style my shelves. 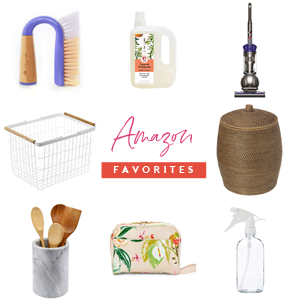 I had a very utilitarian-looking grey mesh waste basket and pen holder knocking around the house, which I updated with a coat of turquoise spray-paint." "The mail baskets were a stroke of inspiration that hardly cost me anything. I’d been searching fruitlessly for a set of wire baskets I could mount on the wall to sort our mail. When I couldn’t find exactly what I was after, I decided to make my own using a $5 cleaning caddy. This has been by far the most popular project I’ve ever posted on my blog – you can read about how I did it here. I also DIYed my own prints in Photoshop to showcase some inspirational quotes and verses that are personally meaningful to me." "I love everything about this space. I love not having mail strewn over our benchtops anymore. I love having a drop zone for all of our daily essentials, which makes it a breeze to keep our kitchen counters clutter-free. I’ve loved being able to work without shutting myself away in a separate part of the house. This is the most practical makeover I’ve ever done, because we use this area every single day, and yet I still get a little flutter of delight when I look at the prettiness. It was a very rewarding space to create, and I feel inspired now whenever I sit down at my desk to work." Karen really put a lot of heart and thought into creating the ultimate workspace. Doesn't the site just make you warm and fuzzy inside? The stencil did a great job in defining the workspace. It sets the area apart from the rest of her home, and is just stunning to look at. The white floating shelves keep the space light and bright, while the small boxes conceal itty bitty clutter causing craft supplies. And can we take a moment to high five Karen for creating adorable rustic baskets out of generic off-the-shelf organizers? She is such a creative cookie! 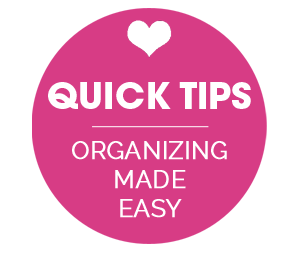 Karen mentioned quite a few helpful tips that can work with any organizational project. The thing that really stuck out for me is that she recognized what didn't work previously, and addressed that head on with the new plan. Having specific organizers for their daily items keeps the counters of the adjoining kitchen free and clear for what they are intended for. 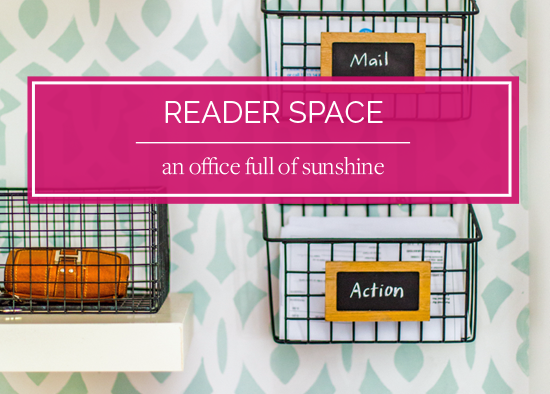 A warm iHeart thank you to Karen for sharing her ultra inspiring office nook with all of us today! 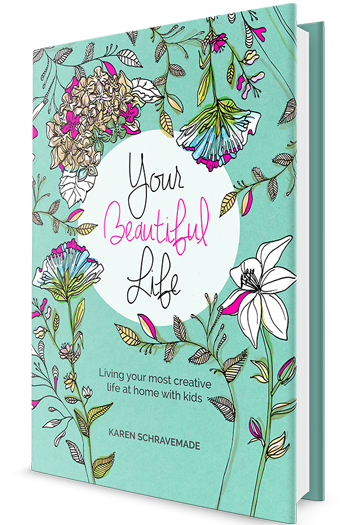 She has definitely been clocking many hours there, as she just released a fabulous eBook appropriately titled "Your Beautiful Life" (which she is giving away for free on her blog here). 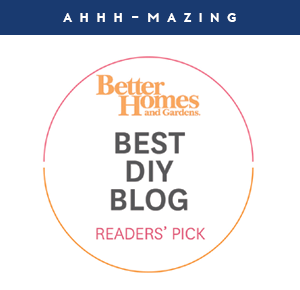 You can read the rest of Karen's office nook story on her blog, and if you love happy, family friendly spaces, stick around and check out the rest of her home as well. What a fabulous open space. And, I love she did it on a budget! This office is to die for! Love it so much! I need to know more about that diaper bag stat! Absolutely beautiful! 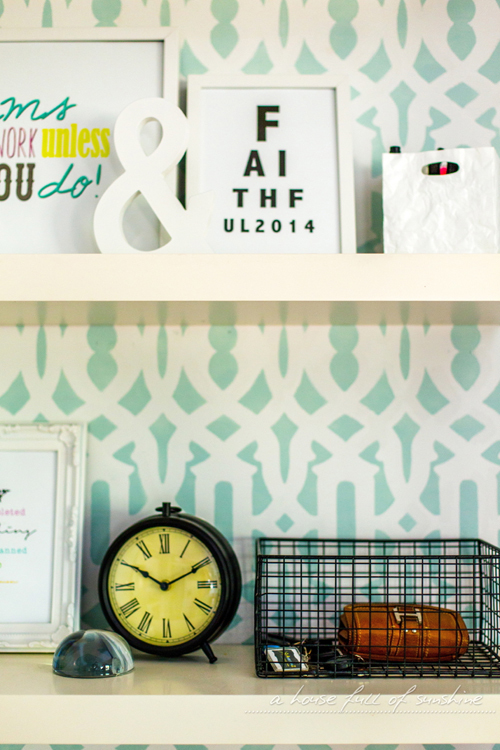 I love the stenciled wall and the "troubleshooting" approach to designing the space. I'm totally inspired to create my own space! Julianne, the bag is the Madame Polly from Isoki. It's an Australian brand, but I think they may distribute overseas - I'm not 100% sure. It's the only bag I've found that's big enough to handle three small kids - love it! I second Julianne - where is that diaper bag from? Love it! Makes me want to work on my office space which is on the back burner as of this moment. I am a home project jumper.....I might start something and stop to finish later. Ah well. There is only so much time in a day. Some of you pictures got me all excited about eventually personalizing my space. What a gorgeous space, love the wallpaper. This looks SO good!! I cannot wait to work on our mudroom and get organized! 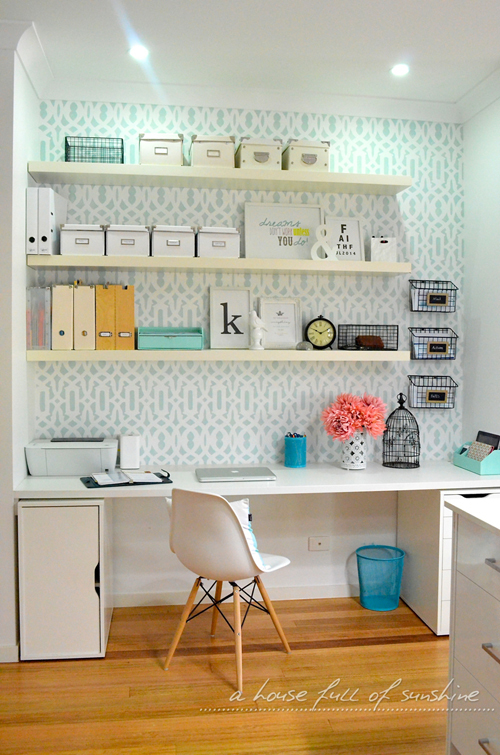 What an amazingly organized space! You have definitely given me some great ideas. My favourite was that drawer for keeping your current in progress paperwork. Mine is always all over my desk or otherwise I sort it into piles and then end up putting it into one pile and then sorting it out again another day! Beautiful space! And really functional too. Love the stencil on the wall. 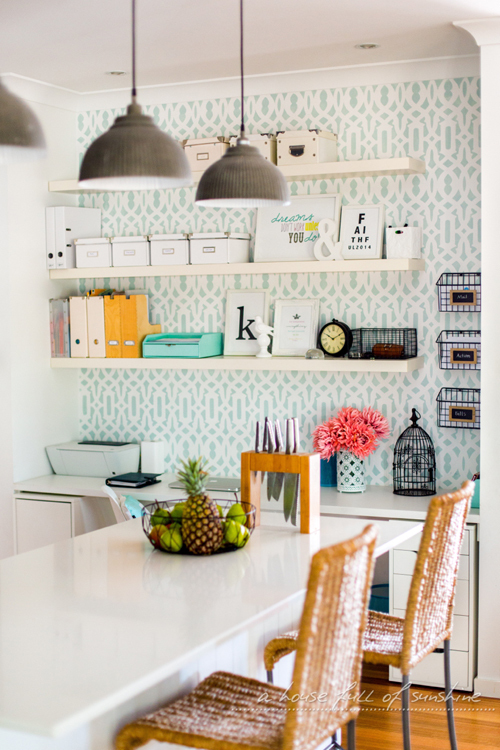 love how beautiful and organized this space in and love the idea of putting these small wire baskets on the wall! Wallpaper love going on here. Gorgeous! where did you get your desk top from? Where did you purchased the office chair (white with wooden legs)?